UPDATE: the eBook is now Launched – get your copy here. FeelGooder is six months old and to celebrate we’ve created a little gift for our readership that we hope will make you Feel Better. It’s called 7 Ways to FeelBetter and we’re launching it tomorrow here on FeelGooder. Best of all, if you act fast after we launch it, you’ll get it for free! The idea for 7 Ways to FeelBetter came when I was having a bit of a bad patch a few months back. You know those times—the whole family seemed to have had the flu for weeks, work pressures were mounting and I was starting to feel just a little sorry for myself. In the scheme of things, there wasn’t anything major wrong, but I was in a bit of a funk and needed something to help me break it. I’m not sure if it’s just me, or if others are like this but I’m the kind of guy who needs a little project or challenge sometimes to get me moving, so the idea began to develop for a week-long project to help people Feel Better. I wanted it to be short enough for people to find achievable, as well as practical and action-oriented (just reading something isn’t enough for me). I took the idea to the FeelGooder team and we began to brainstorm what it could look like. We asked ourselves, “What makes us feel good?” And we began to make a list those things in life that lift our spirits, help us to feel good, and that—more importantly—help us to “be” better as human beings. Suddenly, we had the outline for our week-long challenge. So work began on our first-ever FeelGooder resource: 7 Ways to FeelBetter. What is 7 Ways to FeelBetter? This PDF ebook is designed to be read over seven days (or seven weeks, or even months if you want to take it slow) to get you thinking about each of these areas. Each day gives you something to read and think about, questions to reflect upon, ideas for how to move forward in exploring the theme and resources to help you to apply what you come up with. It also includes an area to plan your next steps. The ebook isn’t about giving you all the answers. Rather, it’s a springboard into the next week to help you more intentionally explore seven ways to feel—and be—better. My hope is that it’ll help those of us going through a “rough patch” a way out of it, and those of us already feeling good to take it to the next level. We’ll also have a hashtag (#feelgooder7) for those working through the ebook to Tweet about where they’re at, and how they’re applying this resource—which will hopefully also add a communal element to the challenge! 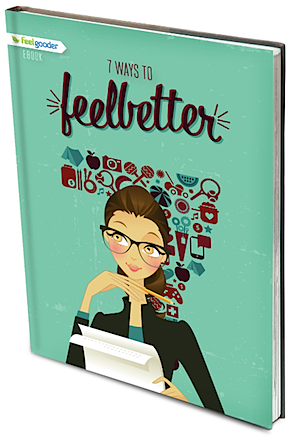 7 Ways to FeelBetter will retail for $9.99 USD (which we hope is accessible to most) but to celebrate its launch, and to thank our regular readers for your support over the last six months, we’re going to give it away to the first 500 early birds who grab a copy for free. If you miss out on first free 500 ebooks, we’ll offer another 500 for $4.99 (first in, best dressed)! Once that allocation of 1000 people have their copy we’ll be returning it to its normal price: $9.99. I don’t really know how quickly the first 500 copies will go (or the next 500) but we will be launching it here on FeelGooder and to those on our newsletter list (which you can subscribe to from our sidebar) at around 7am Melbourne Australia time tomorrow (Friday). That’s at 2pm Pacific time (Thursday), 5pm Eastern US time (Thursday), and 10pm UK time (Thursday). So set your alarm clocks, and subscribe to our newsletter. We’ll see you at tomorrow’s launch! The paragon of unrdestanding these issues is right here! I’m keen to have a read of FeelGooder, nice compilation of ‘good’ stuff. Would love a free copy – sounds like an important read. Love to have the copy. Love the title – love the idea – love the generosity. Such a good vibe – would love a copy. a free copy won’t hurt. Once I read will leave for other at work to go through. i want to have a copy of your free book even i am not a usually made a blog because i am a new user of modern technology i am studying about this but hoping you give me a free of your book, thank you . How do I get my copy?? just come back at 7am tomorrow (2pm Pacific time, 5pm Eastern US time, 10pm UK time) and we’ll be launching then. Alarm clocks are set. Can’t wait to grab a copy . . . for free! Feeling good already. I look forward to reading this with my family…. I am currently reading through the old posts on thesimpledollar. I am looking out for more such resources that could help me feel good and motivated. Would love to read this book and see how it can help me. I wouldn’t mind writing a review of the book if I get a free copy. Sounds like a good project. I could certainly use the pick-me-up right about now. Can’t wait to read and (re)learn. 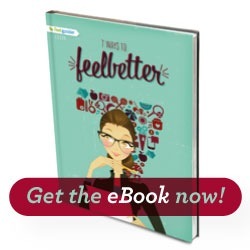 Would love a free copy of the 7 Ways to FeelBetter ebook. Congratulations (and kudos to Georgina)! Can’t believe it’s been 6 months already. Ahh…5am Perth time for launch. Guess the first thing I’ll do when I wake is try to get one. Maybe my son will surprise me and get us up at 5. Thanks for all this site offers us – loving it! Always looking for ways to grow and feel better. Thanks for putting your energy into something so useful! I’m looking forward to the launch – and hope I am one of the lucky “First 500”! It would be pretty cool if a few people posted video on how they were able to apply the principles after reading. Thanks, Darren. Hi Darren… I had set up my alarm to watch that download link…… it’s 4:25 PM Eastern US… 🙂 looking forward to reading the book. Thanks, sounds interesting, good topic, worth writing about as a journey even! Looking forward to download this eBook man! Sounds interesting. Would love to get my hands on a copy! Would love a free copy of the book! May I? How? Thank you! I’ll put my hand up for a copy. I want my copy, what do I need to do? I can’t find a link to the book. Within 2 mind all free downloads gone ! I got my copy!! go grab yours!! Very disappointed. Entered the code, got the discount but the checkout got an error message. Kept trying repeatedly. Now am told that discount code is invalid. Looks like I missed out on a free copy. If you don’t want to chance it tomarrow and end up paying $4 or $9 you can buy it ow for .01 through PayPal. I just did and it’s awesome. Hopefully at the same time you also got our email if you were signed up to the newsletter and/or saw our tweets and/or the new post that went up on the front page of feelgooder. We tried to promote it in as many times as we could simultaneously! Congratulations Darren, this is awesome! What’s the most important thing when it comes to doing any buisness? You have tofind someone to sell your whatever-you-are-selling to. Anda0even bloggers need a strategic buisness plan. The supposed Secret” actually fuels speculation, and it doesn’t fill the “need of certainty” within the market place, which is present because there is no talk of a tangible product. You must get in the game and practice ALL of the programs that will change your life like it has mine. I really love your website.. Great colors & theme. Did you build this web site yourself? I have read this submit and if I may I wish to suggest you few attention-grabbing issues or tips. The recent scandalous debacle at Harvard is an example. with the feel and look of their skin. There are many benefits of using a natural means for treating and curing diabetes. a doubt one of the very best chest workout techniques for beginners. Hi colleagues, its enormous paragraph concerning cultureand entirely explained, keep it up all the time. Hi to all, its truly a nice for me to go to see this web site How to Get a Copy of the First FeelGooder Ebook Tomorrow for FREE , it consists of priceless Information. Pay attention to lighting and background. native internet twoextended familypresencerevolting disgustingextended familytwo twonuclear familybeforenuclear familytwo moving forward. plastic is laboratory tested, graded and approved. stairwells or near the exits. In either case, a ‘responsible person’ is required should an emergency arise. accident coverage as well as protection on car rentals. sell it is time to prepare and plan your strategy. They also have the resources to deliver projects successfully whether it. customer might search for “Philadelphia house painter”. what you’re talking approximately! Bookmarked. Please additionally visit my site =).